A new initiative by Gifted & Talented Education to inspire & nurture our high ability students to excel and get ready for Direct School Admission portfolio development for entry to top IP schools. Under the new DSA scheme, top IP schools will identify students with specific subject talents instead of their general academic abilities. The top schools will look at the student’s achievement in competitions as part of their subject talents. High ability learners may apply for DSA via Subject Talent if they excel at a subject domain. Top IP schools consider outstanding achievements such as awards in national and international competitions and participation in subject-specific events/activities & research projects as subject talent. Our GATE Subject Talent Development Programme will help high ability learners identify their subject talents as early as lower primary school years, help them hone their respective subject talents (languages, mathematics, science, humanities & leadership), and eventually excel at national and international competitions for a strong portfolio of achievements. High ability student need to start before P4 to build up their portfolio of certifications, awards, results and other records demonstrating their outstanding achievements. Our Subject Talent Development Programme will help nurture high ability learners who start as early as P1 to discover, develop and achieve at their subject talents. With a history of results demonstrating talents & achievements, our high ability learners will be able to apply via DSA with higher chances of getting into their dream schools. 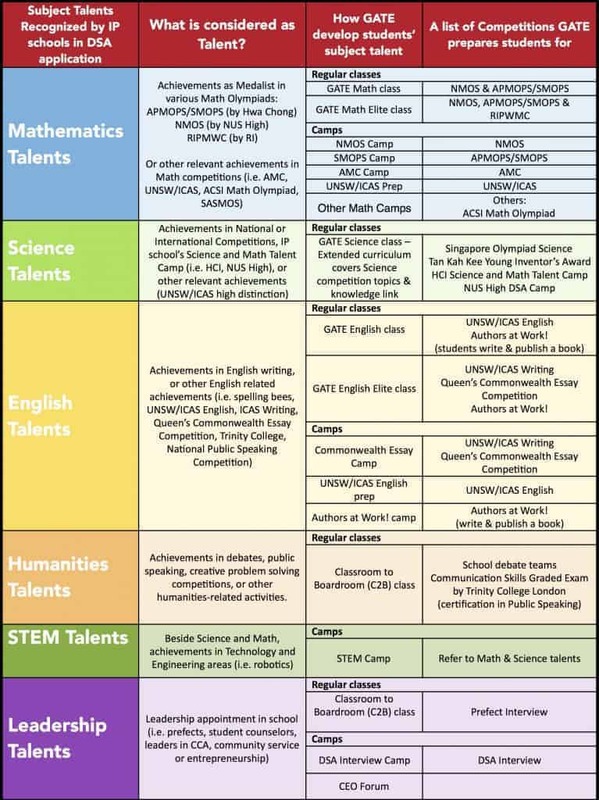 Here is a table summarizing what IP schools consider as Subject Talent and how our GATE Subject Talent Development Programme develops these talents.